For Southern Italians, preparing trays of zeppoles for parties and festivals is a known tradition, and they definitely have the right idea. 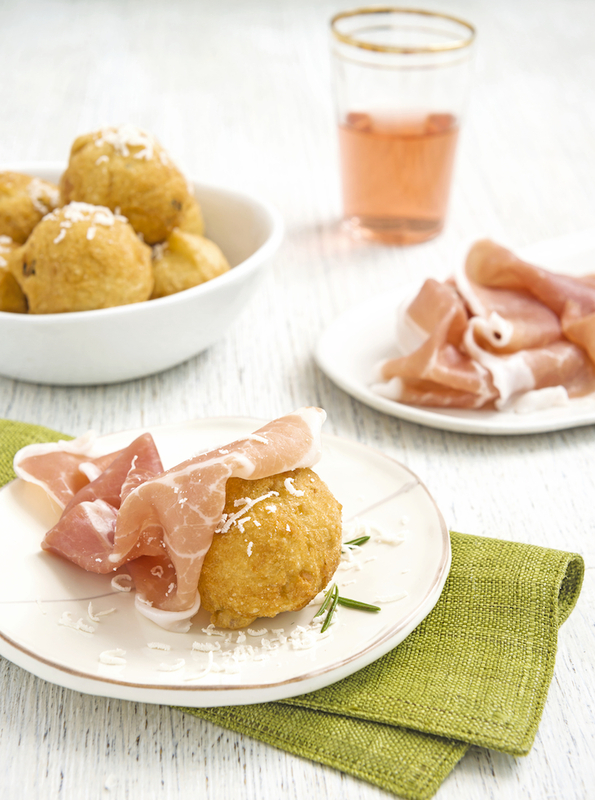 Guests will swoon when you serve this familiar, yet lovely, prosciutto appetizer. Rosemary, Parmigiano Reggiano, truffle oil, and Prosciutto di Parma create a crave-worthy combo with amazing flavor and texture. This prosciutto appetizer is yours for the taking. In a large bowl, mix yeast with 1 cup of the warm tap water and allow to ferment, foam and bubble, about 10 minutes. Next, add as much as needed of the remaining 1 cup of water to make soft dough manageable. Add the flour, salt, and rosemary; mix until well incorporated. Place dough into a well-oiled bowl and allow to rise about 1 to 1 1/2 hours. After dough rises or doubles in size it’s ready. Heat oil to medium-high in a fryer or deep pan to fry then drop tablespoon-sized dough balls in oil turning brown on all sides. Remove with a slotted spoon to a dish with a paper towel and toss with the grated Parmigiano Reggiano. Pile high on a dish and cover with the slices of prosciutto, drizzle with the truffle oil and grate a little more cheese on top! Chefs note: you can also wrap individually each zeppole with a slice of prosciutto.